Bentley will unleash a faster, more powerful and more dramatically styled version of the Bentley Bentayga SUV. 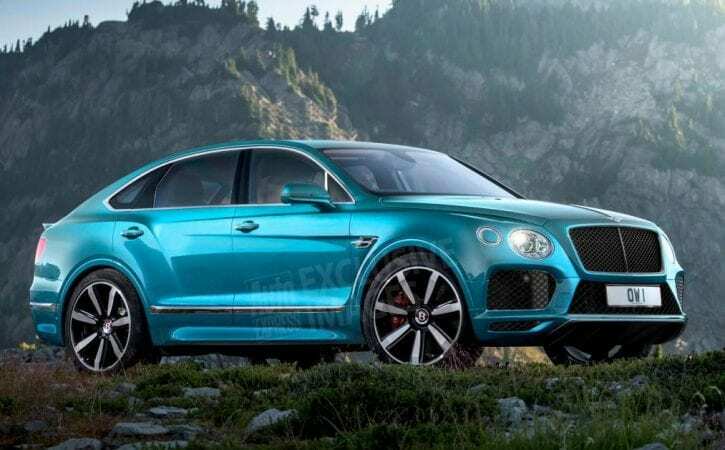 Think BMW X6M and then some, according to Bentley insiders. The Bentayga coupe-SUV will make its debut “sometime next year” and may even appear in concept guise as early as the Geneva Motor Show in March. Our exclusive image shows how the new hot Bentley could look, complete with sloping coupe-style roofline and bulging wheelarches. We expect the new model to use an uprated version of the existing car’s 6.0-litre W12. It’ll get bigger bumpers, bigger wheels and a sportier stance, while also being less bluff and more aerodynamic. This will help shave precious tenths off the Bentayga’s already-impressive four-second 0-62mph sprint time. A 200mph top speed isn’t out the question, either. The coupe-SUV will build on the success of the new Bentayga, which has surpassed all initial sales expectations, despite a starting price (before options) of more than £160,000. A long list of extras is likely, including 22-inch wheels, a sports exhaust and firmer suspension set-ups. Inside, we expect the sloping roofline to marginally affect headroom, while the Bentayga’s 430-litre boot may suffer. But that’s unlikely to affect sales, though, as proven by BMW’s X6. As well as the super Bentayga, Bentley has its sights set on an all-electric hypercar. Both cars will debut “some time next year”. The first may even appear in concept guise as early as March’s Geneva Motor Show. In the meantime, Bentley has also confirmed that there will be two further versions of the regular Bentayga: one powered by a VW Group turbodiesel, and another with petrol/electric hybrid power. Both will go on sale in the next 12-18 months, once deliveries of the W12-engined cars have begun in March. The first-ever Bentayga is due to roll off the production line in Crewe, Cheshire, at noon on Friday, 27 November.